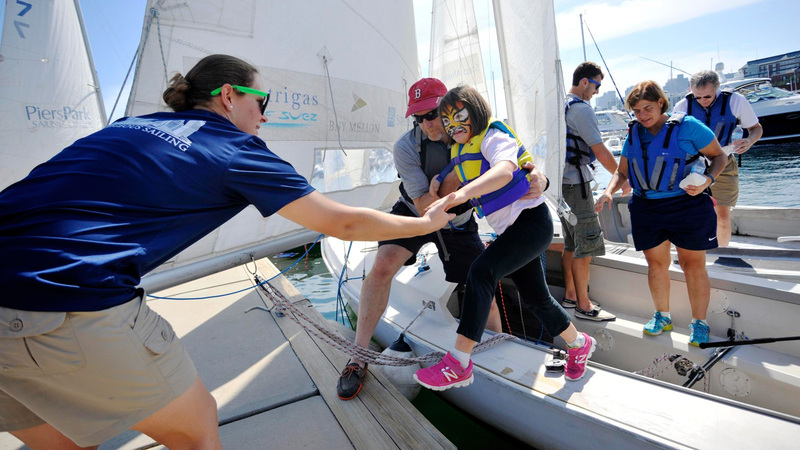 Courageous partners with a variety of adaptive sailing programs to make sailing accessible for adults and children living with special needs. Whether it’s taking a nonverbal 4-year old with severe autism for his first sail or hosting training programs for blind and Special Olympics racing champions, Courageous is committed to adaptive sailing. If you or someone you know wants to sail and has a particular challenge that might require special accommodations, let us know and we’ll be happy to work with you to make it possible! SailBlind, run at Courageous by the Carroll Center for the Blind since the late 1980’s, provides blind and visually impaired people with the opportunity to learn the art and science of sailing. 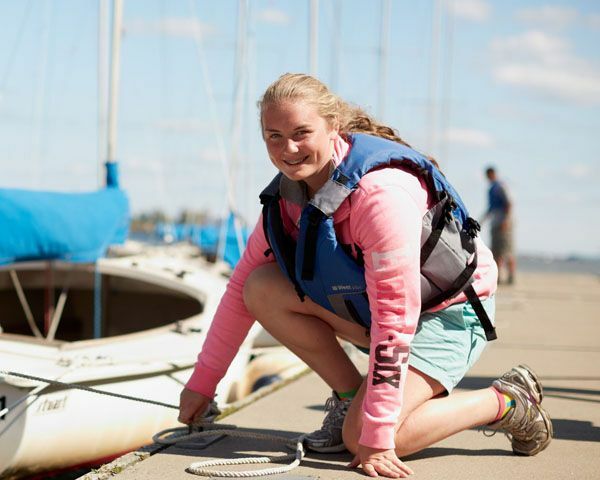 Whether beginner sailors or veteran racers, blind adults and children can have fun and improve their skills using adaptive methods developed by the program, with the help of sighted sailors who volunteer as sailing guides. Participants in the Recreational Sailing program sail Rhodes 19s on Saturdays, and those interested in racing progress to the Step program in a J24, generously donated to Courageous by SailBlind for shared use. The Racing program practices on Wednesdays, and includes some world class racers–two SailBlind boats competed in in the Blind Sailing World Championships in Japan in 2013, with Matt Chao and his team coming in 3rd! 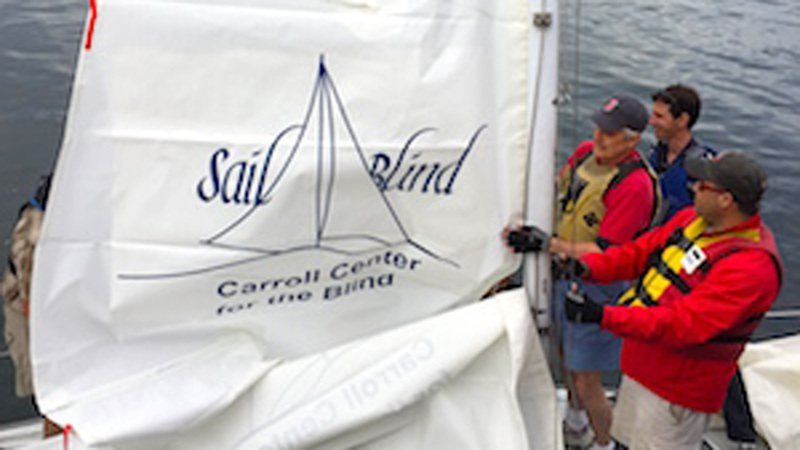 For more information about joining the SailBlind program as a sailor or sighted guide, please visit: www.carroll.org/services/recreation/sailblind. You can also learn more about the competitive world of blind racing through the documentary Sense the Wind, featuring some of our SailBlind sailors, at: www.sensethewind.com. – Matthew Chao. Read his full story here. The sailing teams of Special Olympics Massachusetts (SOMA) have been guests of Courageous Sailing since the early 1990s. SOMA begins weekly Wednesday practices shortly after Courageous opens for the season in May, using the Rhodes 19 fleet. Sailing is a “Unified Sport” in Special Olympics, meaning there are generally two athletes with intellectual disabilities as well as two coaches, called Unified partners, in each crew. By late June each year, some fifteen or more teams from various parts of the state have honed their sailing and racing skills to compete in the Special Olympics Massachusetts Summer Games at MIT. 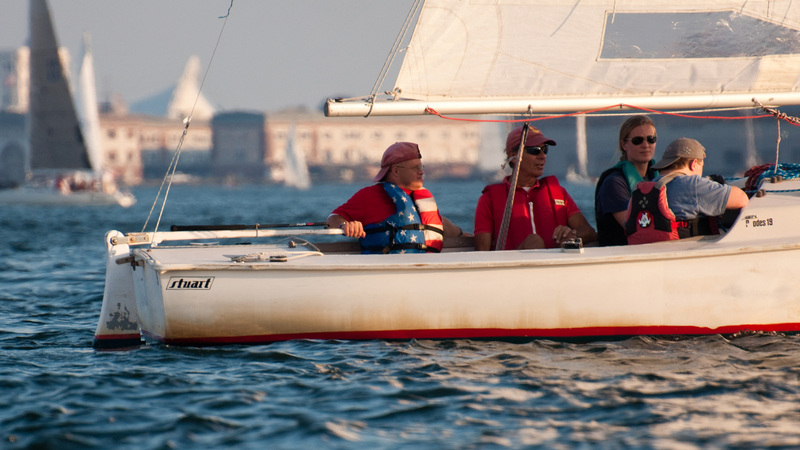 Special Olympics sailors continue to practice at Courageous through September in preparation for the multi-state Rhode Island Special Olympics Invitational Regatta held at the Naval War College in Newport. Massachusetts sailors have won the gold in the top division most years. The Special Olympics sailors progress from Level 1, where a partner skippers the boat over half the time and athletes work the sails, to Level 3, there are three athletes who race the boat and one Unified partner who may only advise on tactics and strategy. Many of the SOMA athletes who train here have progressed from their first sail ever to being competent and confident crew members and competitive skippers. SOMA sailors are excited about how self confident their new skills make them feel, and how much they enjoy sailing and the social aspects of participating in the program. For more information, visit www.specialolympicsma.org. Presented by the Charlestown Waterfront Coalition, Courageous Sailing, and Piers Park Sailing Center. Click on this ONLINE REGISTRATION FORM to sign up. You will be asked to choose a sailing time. 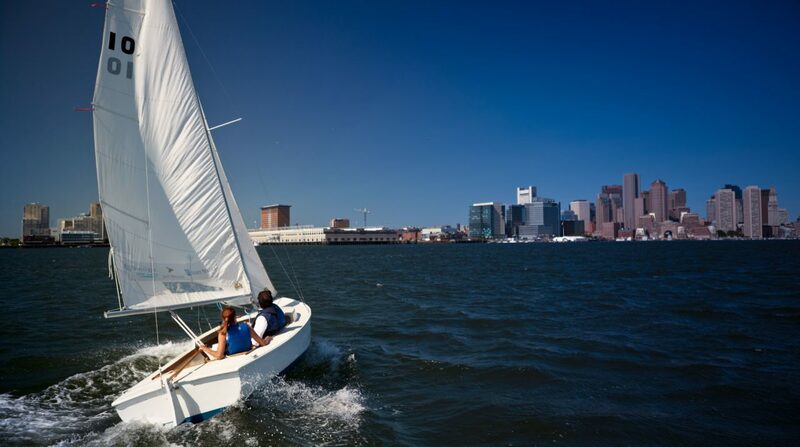 Each year in June and September, Courageous organizes and runs Charlestown Adaptive Sailing Day in cooperation with the Charlestown Waterfront Coalition and Piers Park Sailing Center. Adaptive Sailing Days are an opportunity for adults and kids with any sort of disability to come out for a free one-hour sail with an instructor from Courageous Sailing or Piers Park Sailing Center. A hoyer lift and physically adaptive boats are available for participants who use wheelchairs. Families and friends are welcome, and lunch and bottled water are provided. In the years that we’ve been hosting this event, it has proven to be an incredible experience for instructors, participants, and family members alike. In the words of one mom affiliated with Special Townies, a Charlestown grassroots organization serving children with autism or special needs and their families, being on the water is “just about heaven.” Another mother noted that her son would happily sail all day if given the chance. Clients of Spaulding Rehabilitation Center have enjoyed the chance to get out on the water, too. Every year, more people become part of the community that participates in Adaptive Sailing Day year after year. Please join us for a fun afternoon of sailing and good company! Please email Jen Bodde, Courageous’s Education Director (jen@courageoussailing.org) if you have questions or would like to be added to the mailing list.